WebMD Health Corp., the leading source of health information, today announced that Christina Applegate, Glenn Close, Carrie Fisher and Jeff Gordon have been selected WebMD Health Hero People’s Choice Award finalists for their passionate work to change the healthcare landscape by meeting a health challenge and giving back to others. WebMD is encouraging the public to vote to determine which one of these four inspiring individuals will be chosen as this year’s WebMD Health Hero Award People’s Choice winner. People can visit here to vote for their choice once a day, every day through August 31. Emmy Award-winning actress Christina Applegate’s foundation, Right Action for Women, promotes the early detection of breast cancer and offers help to women who cannot afford screening tests. Applegate was diagnosed with the disease in 2008. She opened up about her double mastectomy in April 2014. Later that year she co-hosted and took part in the 21st annual EIF Revlon Run/Walk for Women, which raised money for breast cancer research, treatment, and counseling. Right Action for Women partnered with ASICS America in 2013 to produce a line of products in “breast cancer pink,” with proceeds going toward the group’s efforts to help women get screened. When Glenn Close talks about mental illness, it’s a family matter. Her family’s history inspired the Emmy Award-winning actress and Oscar nominee to launch Bring Change 2 Mind in 2010. The national campaign works to dispel myths around mental illness and to provide support to those who live with it. The campaign is also educating a new generation to talk openly about bipolar disorder, depression, and other conditions. In 2014, Close and her foundation partnered with Indiana University to start the College Toolbox Project, which encourages students with mental health issues to get help and aims to reduce stigma on college campuses. The foundation also started a similar program for high schools, LETSBringChange2Mind. Carrie Fisher has turned her personal struggles with bipolar disorder and drug abuse into a chance to raise awareness and combat the stigma of mental illness. Fisher, who was diagnosed in her 20s, speaks openly about her condition and her treatment. She wrote about it in her 2008 memoir, Wishful Drinking, which was based on a stage performance and later became a television special. In 2001, she received the Purdy Award from the National Alliance on Mental Illness, which honors a person who has made strides to end discrimination against those with mental health problems. Four-time NASCAR Cup Series champ Jeff Gordon doesn’t leave his winning ways on the racetrack. He puts them in play with the Jeff Gordon Children's Foundation, which funds medical research and programs that offer cancer treatments for kids. In 2012, the group helped launch the Butaro Cancer Center of Excellence, a cancer care program in rural Rwanda. In 2011, Gordon became the spokesman — and driver — for the AARP’s Drive to End Hunger campaign, raising money to feed seniors who don’t have enough to eat. WebMD has celebrated its Health Heroes, people who have made meaningful contributions to improve health and wellness in America, for the last nine years. In addition to honoring a People’s Choice Award winner, WebMD will also honor winners in the following categories: Advocate, Prodigy, Scientist, and Hall of Fame. This year’s winners will be announced in October and will be featured online and within the November/December issue (print and tablet) of WebMD Magazine. 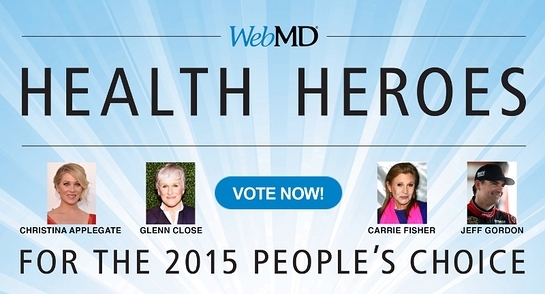 To learn more about the WebMD Health Hero Awards, click here.